The built-in Mobile Device Management (MDM) for Office 365 helps you secure and manage your users' mobile devices like iPhones, iPads, Androids, and Windows phones. You can create and manage device security policies, remotely wipe a device, and view detailed device reports. Have questions? We've put together a FAQ to help address common questions. Be aware that you cannot use a delegated administrator account to manage Mobile Device Management for Office 365. Device management is part of the Security & Compliance Center so you'll need to go there to kick off MDM setup. Click this link: Activate Mobile Device Management. It can take some time to activate Mobile Device Management for Office 365. When it finishes, you'll receive an email that explains the next steps to take. When the service is ready, complete the following four steps to finish setup. You may need to click Manage settings on the Device management page in the Security & Compliance Center to see the following settings. If you don't have a custom domain associated with Office 365 or if you're not managing Windows devices, you can skip this section. Otherwise, you'll need to add DNS records for the domain at your DNS host. If you've added the records already, as part of setting up your domain with Office 365, you're all set. After you add the records, Office 365 users in your organization who sign in on their Windows device with an email address that uses your custom domain are redirected to enroll in MDM for Office 365. After you add the two records, go back to the Security & Compliance Center and navigate to Device management > Manage settings to complete the next step. To manage iOS devices like iPad and iPhones, you need to create an APNs certificate. To do this, follow the steps from the Set up links on the Setup mobile device management page. Under Device policies, select Configure a APNs Certificate for iOS devices. On the Apple Push Notification Certificate Settings page, choose Next. Select Download your CSR file and save the Certificate signing request to a somewhere on your computer that you'll remember. Select Next. Important: Use a company Apple ID associated with an email account that will remain with your organization even if the user who manages the account leaves. Save this ID because you'll need to use the same ID when it's time to renew the certificate. Browse to the Certificate signing request you downloaded to your computer from Office 365 and select Upload. Download the APN certificate created by the Apple Push Certificate Portal to your computer. Tip: If you're having trouble downloading the certificate, refresh your browser. Go back to Office 365 and select Next to get to the Upload APNS certificate page. Browse to the APN certificate you downloaded from the Apple Push Certificates Portal. After you add APN Certificate, go back to the Security & Compliance Center and navigate to Device management > Manage settings to complete the next step. If you don't see multi-factor authentication (MFA) under Recommended steps, you can skip this section. If this option is listed, we recommend you turn on MFA in the Azure AD portal to increase the security of the Mobile Device Management for Office 365 enrollment process. It is turned off by default. MFA helps secure the sign in to Office 365 for mobile device enrollment by requiring a second form of authentication. Users are required to acknowledge a phone call, text message, or app notification on their mobile device after correctly entering their work account password. They can only enroll their device after this second form of authentication is completed. After users’ devices are enrolled in Mobile Device Management for Office 365, users can access Office 365 resources with just their work account. Next to Set up multi-factor authentication, select Set up. To learn how to turn on MFA in the Azure AD portal, see Set up multi-factor authentication. After you set up MFA, go back to the Security & Compliance Center and navigate to Device management > Manage settings to complete the next step. The next step is to create and deploy device security policies to help protect your Office 365 organization's data. For example, you can help prevent data loss if a user loses their device by creating a policy to lock devices after 5 minutes of inactivity and have devices wiped after 3 sign-in failures. In the Security & Compliance Center, go to Data loss prevention > Device management > Device actions > Device policies to create device security policies and access rules. 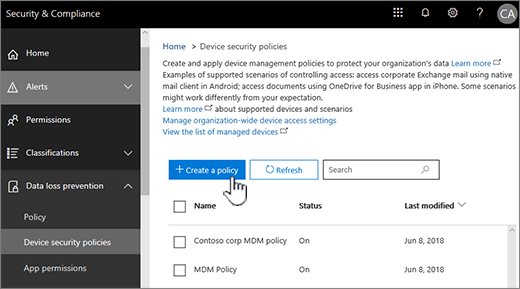 For step by step instructions on how to create a new policy, see Create and deploy device security policies. When you create a new policy, you might want to set the policy to allow access and report policy violation where a user's device isn't compliant with the policy. This lets you see how many mobile devices would be impacted by the policy without blocking access to Office 365. Before you deploy a new policy to everyone in your organization, we recommend you test it on the devices used by a small number of users. Also, before you deploy policies, let your organization know the potential impacts of enrolling a device in MDM for Office 365. Depending on how you set up the policies, devices that don't comply with them (non-compliant devices) could be blocked from accessing Office 365. Non-compliant devices might also have apps installed, photos, and other personal information which, on an enrolled device, could be deleted if the device is wiped. More info: Wipe a mobile device in Office 365. After you've created and deployed a mobile device management policy, each licensed Office 365 user in your organization that the device policy applies to will receive an enrollment message the next time they sign into Office 365 from their mobile device. They must complete the enrollment and activation steps before they can access Office 365 email and documents. See Enroll your mobile device for work or school. Important: If a user's preferred language isn't supported by the enrollment process, users may receive enrollment notification and steps on their mobile devices in another language. Not all languages supported in Office 365 are currently supported for the enrollment process on mobile devices. Users with Android or iOS devices are required to install the Company Portal app as part of the enrollment process.